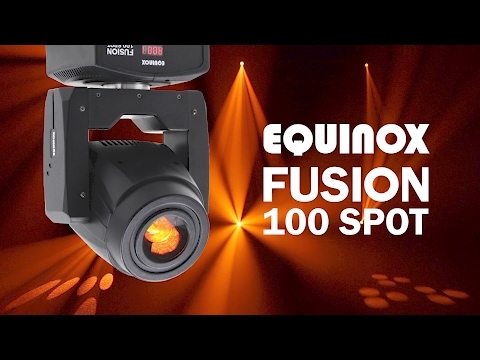 The Equinox Fusion 100 Spot White is a compact, feature-packed fixture ideal for mobile applications as well as installation. The engine of this fixture is a powerful 80W white LED (max. ), which generates sharp beams and patterns. A wheel with 7 colours plus open allows for rich hues to saturate the Fusion 100 Spots beam, while a rotating gobo wheel with 5 rotating gobos including hearts and stars plus open adds to the armoury of on-board effects. Also crammed inside this compact housing is a 3 facet circular prism and a motorised focus to keep the projected image sharp at any distance. With a forward facing show this fixture is ideal for mobile DJs. Considering purchasing the Equinox Fusion 100 Spot MKII (White Housing)? Have questions? Ask people who've recently bought one. Do you own the Equinox Fusion 100 Spot MKII (White Housing)? Why not write a review based on your experience with it. 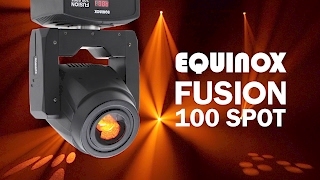 Seen a video for Equinox Fusion 100 Spot MKII (White Housing) online or have you own video? Check out Equinox Fusion 100 Spot MKII (White Housing) on DJkit.com!